This is the first of a three-part series on common questions about climate change: This first article will address the question of whether the climate really changing. Subsequent articles will look more closely at human’s role in climate change and the effects can we expect from climate change. It’s no secret that there’s a crisis of trust between climate scientists and the public. As scientists reiterate with increasing urgency the seriousness of the delicate condition of the planet’s climate, there remains a large contingent of climate change skeptics in the United States- only 55% of Americans stated they were concerned about climate change in a March 2015 Gallup Poll. The consequences of such denial are huge. The Intergovernmental Panel on Climate Change (IPCC) projects that if governments don’t take action to reduce carbon emissions, then we can expect to see irreversible impacts to the climate. In this first article in a three part series, I’ll briefly examine some common questions about about whether there is truly evidence of a warmer climate. What evidence is there for global warming? Climate change has been shown to exist through a multitude of means, including rising average global temperature, rising sea levels, and a reduction of sea ice extent. Scientists look simply at how much the average temperature has changed over the whole globe. Between 1880 and 2012, average temperatures have increased an average of 0.85 °C (1.53 °F) degrees. Though this increase may sound small, it has caused observable effects on the vulnerability of both natural systems and human livelihood worldwide. In addition to the temperature increase, sea level has been rising due to both thermal expansion (as the ocean absorbs excess heat it expands) and melting glaciers at the poles. The IPCC reports a 0.19 m rise in sea level from 1901 to 2010, which has been enough to cause large-scale destruction and displacement in places such as the flat floodplains of Bangladesh. Satellite imagery has also captured large decreases in minimum Arctic sea ice extent. Sea ice is the ice that forms from freezing seawater at the poles and forms a frozen blanket over the Arctic and Southern Oceans. 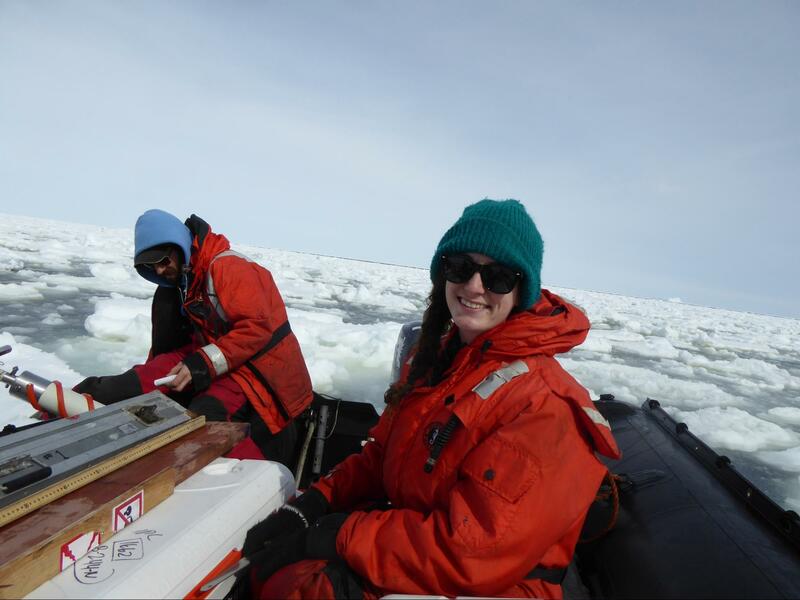 Because sea ice is white and highly reflective, it is important to keeping the planet cool by reflecting solar radiation back into space, which helps reduce the greenhouse effect. In the Arctic Ocean, a large portion of sea is perennial and remains frozen year after year. This minimum yearly sea ice extent has decreased dramatically, and 2015’s maximum sea ice extent is the lowest ever recorded. But what about all the extreme snowstorms? In the winter we are bombarded with news of record-breaking snowstorms pounding the Eastern seaboard. Some use these opportunities to say that global warming has been proven false by contradiction: how can the Earth’s temperatures be rising if it seems that we’re hitting record lows every year? It is important to understand the difference between weather and climate. Weather describes conditions for short time periods, while climate describes long-term average conditions we expect to recur year after year. A one-time anomalous storm will not have the same effect on climate as the consistent increasing frequencies of such storms. On average, across the globe, temperatures are rising. However, climate change doesn’t just mean an increase of the Earth’s mean temperature – the variance is also increasing. This means that, while there is still an overall shift to a warmer mean, there are more extreme cold temperatures in addition to the extreme hot temperatures we’ve come to expect from the changing climate. 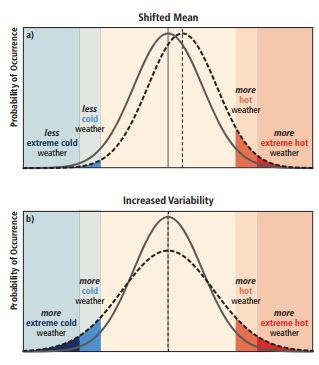 (a) Climate change resulting in a shift toward a warmer mean temperature, and (b) climate change resulting in increased variance, resulting in more extreme hot weather and cold weather. With scientific consensus on the existence of global warming, many climate change skeptics have shifted the debate from whether the Earth is warming to the question of what is causing this change – namely, do humans bear the burden of responsibility? My second blog will address this question. Expect the next chapter to be posted next week.